The design of the V-Concept is based on a simple, dynamic, lightweight and minimalist design. The design of the structure is totally modular, with all its elements integrated into its characteristic "V" shape in section. This allows the creation of multiple posts where communication between the different operators is facilitated. The main challenge faced when developing this new console was getting to hide all the devices and cabling of the console, granting it a clean and tidy look. The rear panel hides the wiring and storage of the devices needed for a job of these characteristics. 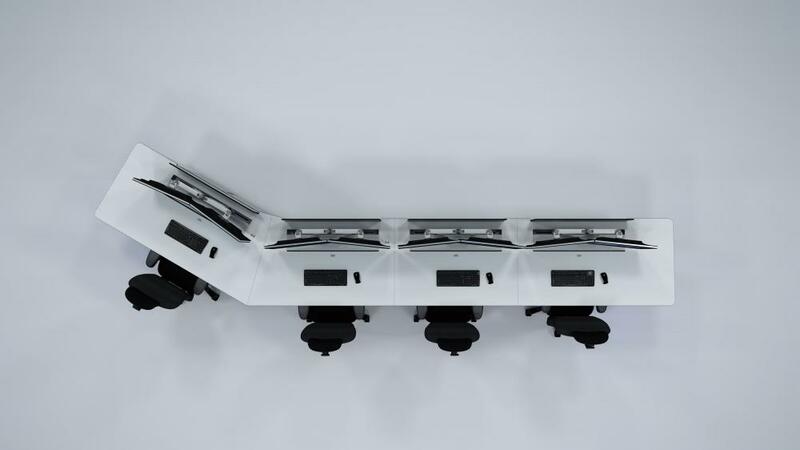 The V-Concept Console has been developed from scratch, taking into consideration the more frequent requirements, needs and problems faced during production and management of the console. Find the perfect solution for every single project. No matter which are the conditions. Let us find the best solution for your control room. The CABLE DUCT ZONE (a) receives all the cabling coming from the table board. 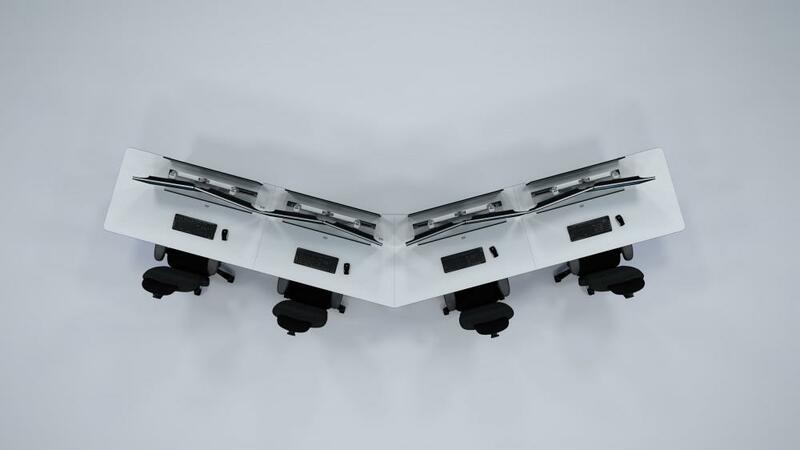 It is divided into two zones vertically: one for the cabling and another for the PCs and electronic devices. The TRAY ZONE (b) is the area where the devices fit inside the console structure and cabling can be driven from one point to another. The CABLING DRIVE ZONE (c) is used for heavy cabling purposes to connect all the structure of the console. It’s the nearest zone to connectivity inside the structure. Moreover, the wiring can be accessed from beneath the console. The Counter is equipped with a lid with customizable power sockets, data, and USB ports in the Cable Duct. In addition, power strips can be installed at the Cabling Drive Zone (bottom of the structure). 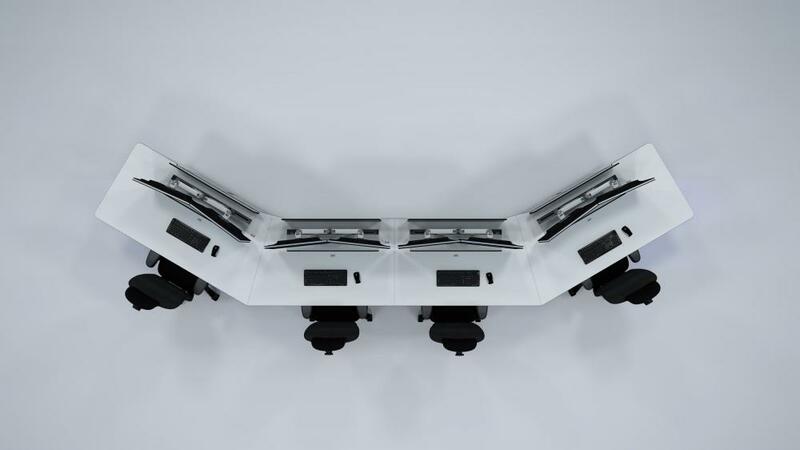 The V-Console has been ergonomically designed according to the criteria of the Ministry of Labor and Social Affairs, and following the standards of the UNE-EN ISO 11064 (Ergonomic design for control centers). The V-Console allows for monitor placing all along the work post and offers an easy and comfortable way to modify, add or remove monitors.